Incidentally I was just learning about the Alhambra on Wednesday. Apparently it has an amazing amount of math in it. You haven’t reached the other side of the board. Whoa, they’re going this far south ? Haha, man I admire anyone who has the patience and skill to put out that stuff. It’s just incredible. Actually, I’m working on a project right now that requires a lot of detail like this. :3 It’s my baby and I’m so excited whenever I work on it (and can I say, your style is also an inspiration for the project? I love it!). Thanks! I definitely wanted to make the cast diverse, mainly because the Vikings did have a lot of run-ins with people outside of Scandinavia, and vice versa. Wow, literally gasped with excitement when I saw this chapter heading. 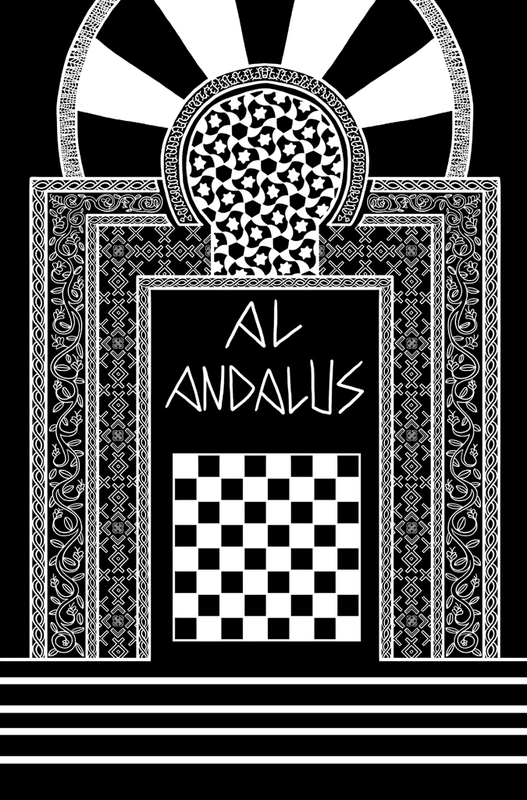 I am so excited to get your take on Al Andalus. I am kind of in love with the Alhambra. Hehe, thank you! It doesn’t take place at the Alhambra (which was built a couple hundred years later) but I did look at pics of it for inspiration. It’s really great to see some homage given to al Andalus and its art (and in a webcomic that focuses on Norse mythology no less). It really was a remarkable civilization that deserves far more notice than it gets in the west. …Also, when are we gonna see the kickstarter, eh? Hahaha, Kickstarter…who knows. Either way, thank you! I can only hope I do the place justice, as it’s actually very hard to find information about Andalusia in the Viking age (there’s more info in the late middle ages, but still not a lot). Some of it is all guesswork, or I just take what I can from what’s around regardless of the era. Hopefully it works! It depends on what specifically you’re looking for, but this was also the golden age of Islam, so there’s quite a bit of scholarship out there on this period. I’d look into the society and culture of the Umayyad Caliphate (and later the Caliphate of Cordoba). Actually the Caliphate of Cordoba is the time period I’m aiming for/focused on! Ibrahim’s father is basically the Caliph of Cordoba, but not any historical one, because that would mean pinning down a time period exactly. It sounds like you might more a good more than I do, so if you come across any errors, please let me know! Wow, the son of the Caliph? This should get interesting. I don’t know much, but I can let you know if I see anything. I really wouldn’t sweat it though, honestly. I think with fiction telling a good story is far more important than historical accuracy, and I trust you to do that much! I really need to comment on this more. Still, I can’t say how excited I am to have Andalusian characters. Yay! I’m glad people are excited. 😀 Thank you! This should be interesting. I don’t know much about your historical sources for this upcoming bit, so I’ll be cracking into my Janson’s Art History book to see if there’s anything in it on this (read: look at the pretty pictures). In the case of sources, I won’t lie, I mostly looked at Wikipedia, a few other sites, and a couple of cursory books. If I had a story that took place in Andalusia for more than one chapter, I would certainly do more varied, in-depth research. I’ve no doubt there’ll be a few errors on my end, but I hope nothing horrendous. Well I for one am disappointed that the Wikipedia article on Alhambra makes no mention of the phenomenal creation that is the Alhambra cake, one of my favorite cakes we made in culinary school. That sucker’s delicious. Old architecture (especially Islamic) and the patterns they put on stuff gives me heart attacks. No I’m kidding but the detail is so intricate and they take so much care to make sure everything is right.